In 2016, California voters passed Proposition 64, finally making it legal for smoking, growing and possessing marijuana recreationally in the state. Although it's estimated that the licenses and laws allowing the selling of marijuana to be legal won't go into effect until sometime in 2018, the state's eager citizens have already begun making ambitious strides towards fully embracing cannabis culture. 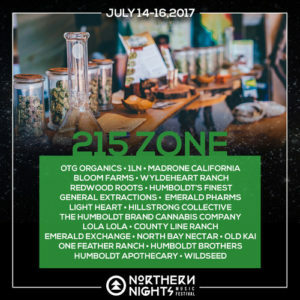 One such Northern California-based festival, the Northern Nights Music Festival, is set to unveil the first U.S. based music festival Cannabis Garden. Deemed the “215 Zone” this centrally located area will be right next to the main stage with a more premiere structure compared to years past. It will be setup similar to a typical music festival "Beer Garden". For those seeking entry, it's just like showing your ID and getting a wristband at other festivals except this time attendees will need to flash a medical marijuana card or identification for proof of entry. Once inside, it's basically a playpen of all your wildest cannabis dreams. Medical marijuana patients will be invited to sample product from various dispensaries and vendors like Emerald Pharms, Bloom Farms, Humboldt Brothers, Emerald Cup, Royal Gold, Humboldt Brand – to name a few. Located in The Emerald Triangle between Humboldt and Mendocino counties, this year's festival will boast an incredible music lineup with acts like Jai Wolf, Living Legends, Big Wild, Justin Jay's Fantastic Voyage, Dirtwire, NoMBe and much more. Although many festivals that are billed as more cannabis specific events (ie. Cannabis Cup) and have hosted various dispensaries on-site, this larger crafted experience is a bold move towards integrating cannabis use into the more mainstream music festival (beyond what fans kind of already do on their own of course). Boutique festivals like Northern Nights continue to act as the trial and error/trendsetters pushing the festival experience forward. Who knows, maybe it's only a matter of time before we have cannabis vendors at festivals like Coachella or Outside Lands.